On 29 March 1981 a weird loner called John Hinckley arrived in Washington on a Greyhound bus and checked into room 312 of the Park Central Hotel on 18th and G streets. The next day, his 70th in office, Reagan arrived at the Washington Hilton hotel at 1.45pm to address 3,500 members of the American Federation of Labor and Congress of Industrial Organizations. At 2.25pm Reagan left the building by a side entrance on T Street and waved to the small crowd outside. As he waved, Hinckley stepped forward and fired a Rohm RG-14 .22 calibre blue steel pistol six times in three seconds. The six bullets were Devastors, designed to explode on impact, although none of them did. 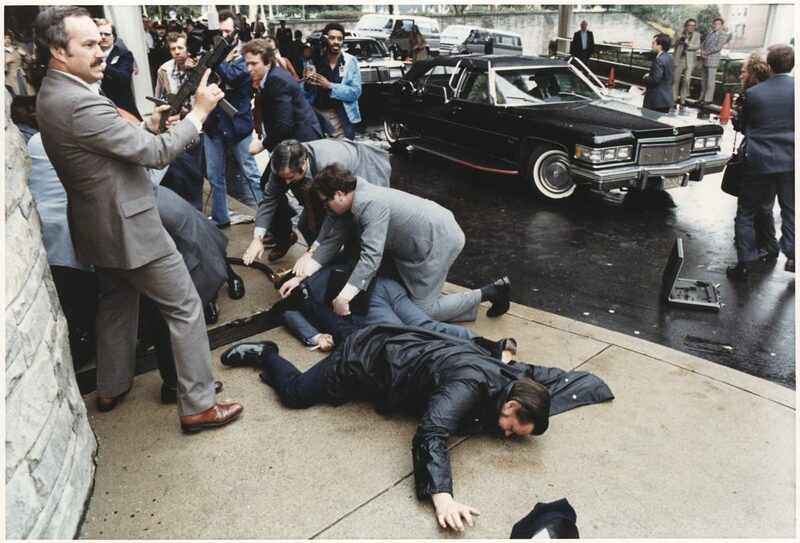 The first round struck White House press secretary James Brady in the head; the second hit policeman, 47-year-old Thomas K. Delehanty in the back; the third missed its target and hit the window of a building across the road; the fourth hit Timothy J. McCarthy, 33, of the Secret Service in the abdomen as he courageously stood in front of Reagan; the fifth struck the bullet-proof glass of the presidential limousine and the sixth bounced off the side of the car and hit Reagan under his left arm. The president then began coughing up blood and the limousine screeched away from the White House and towards George Washington University Hospital. The car arrived at 2.35pm and Reagan, ever the showman, walked into the hospital but as soon as he was inside he collapsed. Parr and Shaddick carried him to Trauma Bay 5 where the medical staff cut off all the president’s clothes. Reagan lay naked with blood pouring from his mouth, moaning that he could not breathe. A doctor cut a hole in Reagan’s throat and put a breathing tube into his throat but it did not help. At 3.24pm Reagan was taken into theatre for surgery to remove the bullet. Dr Benjamin Aaron, chief of thoracic surgery, performed the operation. Dr Aaron found the bullet 3 cm (1 in) below the president’s heart. Reagan’s chest cavity was filled with blood and he had lost half of the blood in his body. Dr Aaron immediately decided to operate to repair the damaged lung. Hinckley had shot Reagan to impress the actress Jodie Foster, with whom he had become obsessed after seeing her in the 1976 film Taxi Driver. In his hotel room among other items was a note to Jodie Foster asking, “You are a virgin, aren’t you?” On 21 June 1982,after a seven-week trial, Hinckley was found not guilty by reason of insanity and sent to St Elizabeth’s Hospital, an asylum. On 17 December 2003 Judge Paul Friedman decided that Hinckley no longer posed a serious danger to himself or others and approved unsupervised visits to his parents in the Washington DC area.